The Russian side hold a 2-0 lead heading into this game having triumphed in both games on Russian soil last week. That was then though and fans will head along to the Kombank Arena on Monday night hopeful that the Belgrade side can grab the win that keeps the series alive. 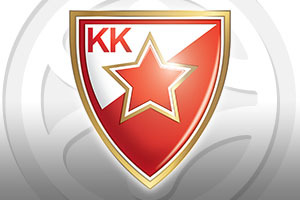 This is the first ever home game for Crvena Zvezda in the playoff and it is an all or nothing game. If the hosts fail to win, the away team takes the 3-0 lead in the series and there is no need to play another game. This suggests that CSKA Moscow will be favourites but sometimes the desire to keep a series alive is greater than the desire shown by a team who needs one win out of a possible three games to get through. It has been a close run of games and Zvezda haven’t been overrun in either of the two games, so they are in with a chance. 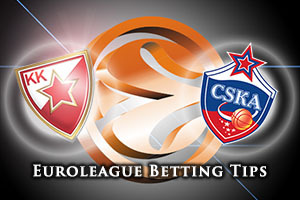 CSKA Moscow are strong opponents but the will of the home crowd in Belgrade may go a long way to inspiring the hosts to a strong result. CSKA Moscow are looking to make the Final Four for the 13th time in 14 seasons and they have a few chances to do so. A win on Monday night means that they have time to rest up and there is no need for the next two games to be played. This will be in the mind of CSKA and you can expect Milos Teodosic and Nando De Colo to be the main tormentors of the home team once again. There is definitely a lot riding on this for both teams but the overall form and consistency shown by the Russian side this season means that they’ll be favourites heading into this clash which starts a big week of European basketball. Taking Crvena Zvezda at +5.5, at odds of 1.90 should provide you with a chance to stay close to the album throughout the game. When it comes to the Over/Under market, you will want to go OVER 163.5 at odds of 1.90. Bet Now!